Pins on the Arduino header are accessed via the built-in variables D0..D13 and A0..A5. Note: Pixl.js has one available I2C, SPI and USART (and infinite software SPI and I2C). Unlike other Espruino boards, these peripherals can be used on any pin. 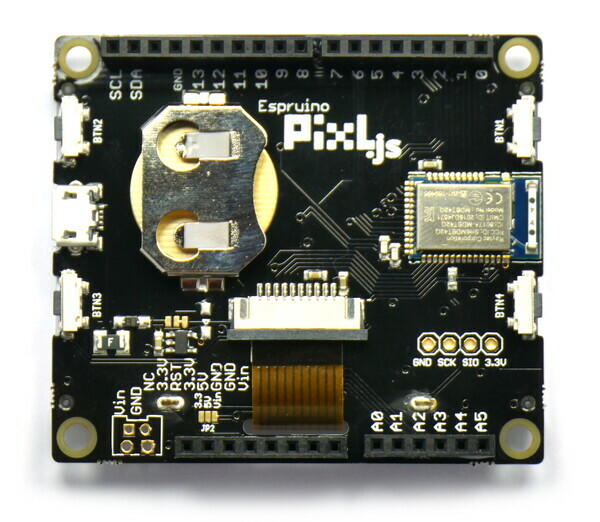 Pixl.js is a 3.3v device, and is only designed for 3.3v shields. Do not short all 3 pins of the solder jumper together! This will connect 3.3v to Vin, which will power your Pixl's processor (and the LCD) directly from Vin, which is likely to be a high enough voltage that it will permanently damage it. NOTE: When you get it, your Pixl has a protective film over the front of the LCD. It may appear scuffed of scratched, but can easily be peeled off from one corner. g.flip() only updates the area of the screen that has been modified by Graphics commands. If you're modifying the underlying buffer (g.buffer) then use g.flip(true) to update the entire screen contents. Pixl.js comes with a built-in menu library that can be accessed with the Pixl.menu() command. "title" : "-- Main Menu --"
"title" : "-- SubMenu --"
See http://www.espruino.com/graphical_menu for more detailed information. You can change the LCD screen's contrast with Pixl.setContrast(0.5) with a number between 0 and 1. You can also write single byte commands to the ST7567 LCD controller using the Pixl.lcdw(...) command if you want to experiment with different LCD modes. Pixl.js's LCD acts as a VT100 Terminal. To write text to the LCD regardless of connection state you can use Terminal.println("your text"). Scrolling and simple VT100 control characters will be honoured. When on, the LCD draws around 200uA (0.2mA). You can turn the LCD off to save power with Pixl.setLCDPower(true/false) if you need to. When resuming, the LCD will be refreshed to display what was previously on the screen. The only LED available on Pixl.js is the backlight, which is controllable via the LED or LED1 variable. There are 4 buttons on Pixl.js. Starting in the top left, going clockwise, they are BTN1, BTN2, BTN3 and BTN4. You can access a button's state with digitalRead(BTN1) or BTN1.read() (the two commands are identical). BTN is also defined, and is the same as BTN1. GPIO pins are numbered D0 to D13 and A0 to A5 (matching the Arduino header). They are marked on the PCB (for D0 to D13, the D is omitted). You can use the same digitalWrite/digitalRead commands with these that you did with the LEDs and buttons, but you can also use PWM, I2C, SPI and Analog. On the 2v01 firmware release (which many Pixls ship with), NFC doesn't work. The 2v02 firmware will have this fixed, however 'cutting edge' builds from http://www.espruino.com/Download#pixljs can be used and will work as well. When power is first applied, Pixl.js checks if pin D0 is at 3.3v (which will be the case if it is connected to a Serial port's transmit line). If it is, it initialises the on-chip UART on D0 (Pixl.js RX) and D1 (Pixl.js TX) and puts the Espruino console (REPL) on it at 9600 baud. Note: Serial1 is not enabled by default because it requires the high speed oscillator to stay on, which increases power draw a huge amount. If you connect the UART but don't power down and power on Pixl.js, you won't get a serial port. Reset Pixl.js with BTN1 held down. The display will show BOOTLOADER RELEASE BTN1 FOR DFU. Make sure release BTN1 before the progress bar reaches the end. If choosing the ZIP file opens the ZIP and displays files inside (it can do on some Android 7 devices) then hit back, long-press on the ZIP, and choose Open in the top right. Click it, choose Distribution Packet (ZIP), and your Download. If clicking on the downloaded zip file opens its contents (Android 7 may do this) then long-press on the zip and tap open instead. For more answers please check out the Bluetooth Troubleshooting or General Troubleshooting pages. My Pixl's screen was scratched when I got it! The Pixl comes with a protective film over the LCD. The film itself is very soft which means it picks up scratches during manufacture and packing, however it is easy to peel off from one corner and will reveal a shiny new LCD.